To be held at the Roma Administration Centre on 23 July 2014. Director Infrastructure Services – Cameron Castles, Director Development, Facilities and Environmental Services – Rob Hayward, Director Corporate, Community and Commercial Services – Sharon Frank, Manager Community Services – Julie Neil, Manager Financial Operations – Alan Marchant, Manager Infrastructure Planning and Design – Kym Downey, Manager Water, Sewerage and Gas – Troy Pettiford, Coordinator Debtors – Debbie Gehlaar, Finance Officer – Angela Betts, Be Healthy Communities Officer ­– Natalija Pearn. The Honourable Jeffrey Seeney MP – Deputy Premier, Minister for State Development, Infrastructure and Planning. John Cotter – Chairman of the Queensland GasFields Commission. The Mayor welcomed all present and declared the meeting open at 9.21am. That the minutes of the General Meeting (10-11.06.14) held on 11 June 2014 be confirmed. The Staff nominees and winner of the “Maranoa Medal” were announced by the Mayor during the meeting. This report provided a copy of the confirmed meeting minutes of the advisory committees that held meetings during the months of April 2014 to May 2014. · Bassett Park Advisory Committee - 15/04/14. Cr Schefe declared a ‘Conflict of Interest’ in the following item due to the request being put forward by program participants and Tania Schefe of Ezi As Fitness, who is also Cr Schefe’s wife and receives payment for services delivered as class instructor for the program. Cr Schefe left the Chamber at 9.22am, taking no further part in discussion or debate on the matter. Tania Schefe, Heart Starters class instructor, requested the continuation of financial support (venue hire) from Be Healthy Maranoa (BHM) post 30 June 2014. It was stated that income from this class does not cover the associated costs to deliver this service. That Council approve the use of Council funds ($600 per annum/$50 per month ) to pay for hire of the Senior Citizens Hall in Roma, in support of the seniors’ exercise class (Heart Starters), effective 1 July 2014. At cessation of discussion and debate on the abovementioned item, Cr Schefe entered the Chamber at 9.25am. Maranoa Regional Council has a current service agreement with the Department of Education, Training and Employment to provide a limited hours’ childcare program for the families of Surat. The Department has increased the funded amount for limited hours’ childcare centres from $37,333 to $46,034. In order to release the funds, it is a requirement that Council sign a Deed of Variation to the existing service agreement. That Council approve for the Deed of Variation to be signed by the Chief Executive Officer to allow the release of funds for the Maranoa Early Learning Centre in Surat. Cr O’Neil declared a ‘Conflict of Interest’ in the following item, due to him being employed on a casual basis with Macquarie Regional Radio Group (4ZR), one of the organisations subject to Council’s consideration in the presented report, and left the Chamber at 9.26am. Maranoa Regional Council shares Council news via a range of communication forums. 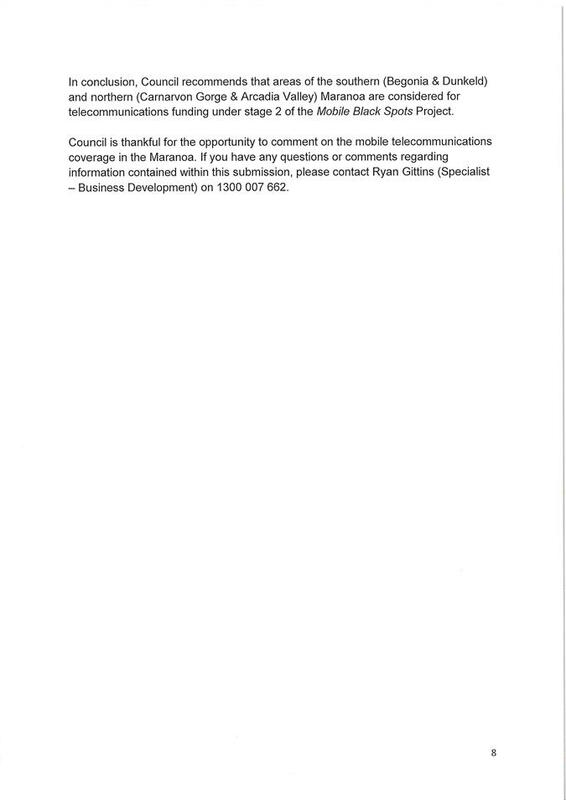 With the expiration of two of these communication contracts ending 30 June 2014 (Western Star’s Council News advertisement and 4ZR’s Councillor Chat radio segment), Council’s views were sought on the current and future forums. 1. Renew the Council News advertisement contract with the Western Star until 30 June 2015 (no changes to current format). 2. Renew the Councillor Chat radio segment with 4ZR until 30 June 2015 (no changes to current format). At cessation of discussion and debate on the abovementioned item, Cr O’Neil entered the Chamber at 9.29am. · Cr Wendy Newman at the fourth Local Government & Public Sector Building Maintenance and Management Conference from 11 – 12 November 2014 in Sydney. The Department of Natural Resources and Mines sought Council’s views on an Application for Permit to Occupy over Lot 7 on EG124 being a Reserve for grazing purposes. The applicant had applied to Maranoa Regional Council to have a Dangerous Dog registration fee not commence until July 2014 (deferred from initial declaration). That Council request the applicant pay the applicable fee to retain a Dangerous Dog within an urban area of Maranoa Regional Council, less the amount previously paid for registration for the 2013/14 financial year. The Festival of Small Halls is an outreach project developed by the Woodford Folk Festival with the aim of bringing acclaimed international and national artists to regional and remote communities. The Maranoa Regional Council has been invited to be involved in the 2014 touring program. The organisers have also developed a workshop component of the program, the cost of which is subject to an application for funding through the Regional Arts Development Fund (RADF). The proposal also includes opportunities for local musicians to perform alongside the artists as part of the event program. That Council confirm the Maranoa Regional Council as the host partner for the 2014 Festival of Small Halls, to be held at the Mitchell Memorial Hall in mid October 2014; conditional upon the RADF funding value of $3,737.50 being considered and approved through the normal RADF assessment process. The Surat Library has been contacted by the Queensland Aged and Disability Advocacy (QADA) organisation requesting approval to host a community information session at the Surat Library from 11.30am to 12.30pm on Monday 25 August 2014. QADA also requested assistance with advertising the visit and the information stand. 1. Approve the request from QADA to set up a display stand and hold an information session. 2. Offer marketing support through the distribution of information through Council’s existing communication forums. A Post Event Report was provided for the 2014 Volunteer Week Celebrations held the week of 12 to 18 May across the Maranoa (events in Roma, Injune, Bymount, Surat, Teelba, Mitchell, Amby, Wallumbilla and Yuleba). The audit report was presented to the Roma Saleyards Advisory Committee at their meeting held on 1 May 2014 for review and comment. 1. Endorse the Committee’s recommendation to adopt the density standards as contained within the agenda report, and approved under the requirements of NSQA & EU (Economic Union). Cr Wason advised that a number of concerns had been raised over a lengthy period of time with respect to non-livestock trucks congesting the hard stand parking and unloading areas at the Roma Saleyards. At present there is limited space for non-livestock parking. A site inspection identified a potential suitable parking area north west of the Canteen. 1. Consider the identified location for potential positioning of a hard stand parking area. 2. Further investigate the associated cost of works. 3. Further investigate potential funding opportunities both externally and internally. The Mitchell RSL and Combined Sports Club is the management organisation that manages the day-to-day operations of the Mitchell RSL and Combined Sports Complex. The Club is the governing body that auspices other clubs that use the facility including the Mitchell Junior Rugby League and Netball Club, Mitchell Senior Rugby League Club, Mitchell Campdraft Association, Mitchell Rodeo Association and the Mitchell Cricket Club. Council has historically had an affiliation agreement with the clubs, and has been in negotiations in regard to entering a new agreement. 1. Enter into the affiliation agreement as presented, with the Mitchell RSL and Combined Sports Club, Mitchell Junior Rugby League and Netball Club, Mitchell Senior Rugby League Club, Mitchell Campdraft Association, Mitchell Rodeo Association and the Mitchell Cricket Club in regard to management and ongoing support of the Mitchell RSL and Combined Sports Complex. 2. Note change to clause 3.6 of the draft affiliation agreement previously circulated and agree that Council will facilitate and fund administration of the Mitchell RSL and Combined Sports Club with funding extending to financial accounts’ and statements preparation of all parties, in recognition of the club’s role in managing the existing shared use and single entity arrangement, incorporating a combined bank account, at the Mitchell RSL and Combined Sports Complex. 3. Note change to clause 3.7 of the draft affiliation agreement previously circulated and agree that Council will maintain the grounds and buildings to a standard not detrimental to the use of the facilities. 4. Delegate authority to the Chief Executive Officer to sign the affiliation agreement on behalf of Council. The Booringa Blokes Men’s Shed Inc had requested a refund of the Building Application Fees paid to Council for Building Works at 90 Mary Street, Mitchell. That Council refund the building application fees paid for the approval of building works for the Booringa Blokes Men’s Shed Inc. at 90 Mary Street, Mitchell. Maranoa Regional Council has a current service agreement with the Department of Communities, Child Safety and Disability Services to provide Community Care Services. The increased amount of $3,212.62 will only be released if Council agrees to sign the deed of variation. The deed of variation provides an increased capacity to deliver these service types within the Maranoa region. That Council authorise the Chief Executive Officer to sign the deed of variation to increase funding for the service types, being social support and domestic assistance. The purpose of this report was to adopt an Audit Committee Policy about the establishment of an Audit Committee, pursuant to section 105 of the Local Government Act 2009 and Terms of Reference which have been prepared for the Committee, setting out the specific responsibilities of the Audit Committee and the manner in which the Committee will operate. Furthermore, pursuant to section 210 (3) of the Local Government Regulation 2012, Council is required to appoint one (1) member of the Audit Committee as chairperson. 1. Adopt the Audit Committee Policy and Terms of Reference. 2. Appoint Bob Coomber as Chairperson for the Maranoa Regional Council Audit Committee. 3. Endorse the continued membership of Ossie Behrend, Adam McEvoy and Karan Pearn for the remaining term of the current Council, given their role on the previous committee, and in recognition of the value of continuity during Council’s current reform process. 4. Note the intention that future appointments of external persons will be made by way of a public advertisement. That Council endorse the Internal Audit Charter and Internal Audit Plan, inclusive of minor formatting corrections as advised. The report tabled the draft new Corporate Plan that has been in development over the last 12 months, with increased intensity over the last quarter. The draft plan was tabled for Council’s consideration in sufficient time to ensure that the draft budget and operational plan (work programs) can be aligned with the new plan. These are scheduled for consideration and adoption at Council’s planned Special Budget Meeting on 23 July 2014. Councillors acknowledged the work of the Chief Executive Officer (CEO) and staff in developing a draft plan that is easily understood and transparent. The CEO also acknowledged key staff in preparing the draft, including the new Executive Management Team and Specialist – Organisational Development, Noela Ward. 1. Adopt the Corporate Plan, with the first year of the Plan being 2014/15. 2. Distribute the Corporate Plan to the Audit Committee members, for discussion at the next Audit Committee meeting. 3. Incorporate the Corporate Plan in other upcoming community engagement activities once the document is professionally formatted. The purpose of this new policy is to acknowledge Council’s obligations as a Public Sector Entity under the Public Interest Disclosure Act 2010 and to establish Council’s commitment to the promotion and proper management of Public Interest Disclosures. The Mayor and Chief Executive Officer formally thanked Maranoa Medal nominees for their contributions and announced award winner for the 2012/13 year, Annette Gallagher. Ryan Gittins, Nathan Whittaker, Adam Scarce, Kevin Jenkins, Madonna Mole, Martin Burke, Briony O’Bree, Margaret Langton, Samantha Thrupp, Benjamin Knight, Oliver Dowd, Jessica Reiser, Matthew Liston, Kim Edwards, Grant Wedlake, Jasmine Lines. Council adjourned the meeting for morning tea at 10.25am. Cr O’Neil left the Chamber at 11.42am. Cr O’Neil entered the Chamber at 11.45am. Cr Denton left the Chamber at 11.55am. Cr Denton entered the Chamber 12.07pm. That Council open the meeting to the public at 12.47pm. Council adjourned the meeting for lunch at 12.48pm. That Council accept the applicant’s proposed rates payment arrangement, subject to all rates, charges and arrears accumulated up until 30 June 2015 being cleared in full by that date. As a result of increased road construction activities, Council has invited submissions from providers of Design & Construct Services who are interested in being included on an approved contractor list for Maranoa Regional Council. The Design & Construct services will include, but not be limited to, the design and construction of roads and bridges. This report recommended to Council the formal write-off of debts that are deemed to be irrecoverable or unviable for Council to pursue further recovery action. 1. Approve the write-off of debts as presented owing to their current status of being irrecoverable or unviable for Council to pursue further recovery action to the value of $139,878.14 for General Write-Offs as at 30 June 2014, and $81,568.79 for Private Works Write-Offs as at 30 June 2014 (Total $221,446.93). 2. Be provided further recommendations for consideration at an upcoming workshop in relation to a review of the credit application process for identified parties with outstanding payments to Council. 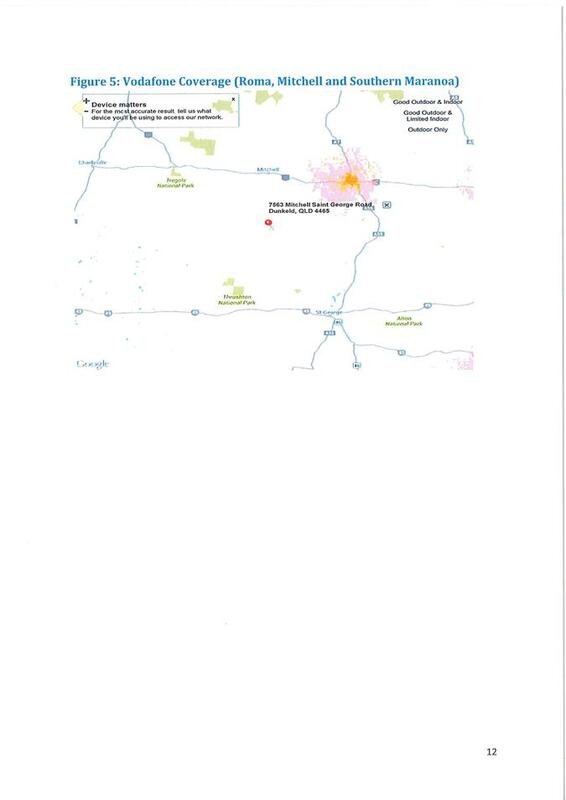 Council has been offered the opportunity to purchase the identified parcel of land located in Injune. Council was asked to consider the offer. That Council decline the offer to purchase the identified parcel of land located in Injune. Due to the rising amount of rent arrears, Horizon Housing management have requested Council waive any outstanding rental arrears from previous tenants of the Rural Housing Service Centre Pilot. That Council not approve the requested waiver of outstanding rent arrears incurred from previous Rural Housing Service Centre tenants. The applicant had requested an exemption/concession of rates. That Council advise the applicant that they are currently exempt from paying general rates. Further that, in accordance with Council’s adopted Revenue Statement, concessions do not apply to water access and sewerage charges. Tender 14025 was previously awarded to Bailey Civil Constructions, however due to other commitments they are unable to undertake the project. This report called for the tender to be re-awarded. That Council re-award Tender 14025 and Contract to FBD Constructions for a total of $420,000 (excluding GST). In accordance with Council resolution GM/03.2014/67 from the General Meeting on 26 March 2014, an independent market rental cost report was received, and was presented to Council for consideration. 1. Note the values documented within “Report on Market Conditions – Central Business District Vacant Land Leases Located with Roma Qld 4455”. 2. Delegate authority to the Chief Executive Officer to negotiate on Council’s behalf. 1. Advise the landholder that Council does not maintain a public road within the identified road reserve and that the policy “Construction of Roads for Access to Property” applies. 2. Liaise with Santos requesting that they gravel the identified area due to water run-off from their property across the track. That Council advise the landholder that Council does not maintain a public road within the identified road reserve and that the policy “Construction of Roads for Access to Property” applies. The report recommended adjustments to the Organisational Structure, to include three position changes. Under Council’s policy, the road in question is a property access and not a public road. The matter be deferred for further consideration at the next General Meeting scheduled for 9 July 2014, pending the receipt of further information. The Agreement to Purchase the identified property in Roma was received electronically by the Chief Executive Officer (CEO) from Council’s lawyers on 22 May 2014. At this time, the CEO sought Councillors’ endorsement of the contract terms to enable arrangements to progress. The purpose of this report was to formally ratify this endorsement, and provide Councillors with an update as to the progress of the acquisition and settlement. 1. Formally ratify delegation to the Chief Executive Officer to sign the Agreement to Purchase for the specified property. 2. Note the status of the acquisition and settlement. Council received a request from the applicant to make a donation to Pinaroo Roma in lieu of paying the Mitchell Multi-Purpose Health Service (MPHS) levy. Councillors had discussed the matter and reached an agreed position at its workshop on 23 April 2014. Due to the CEO needing to take urgent leave for family reasons, there was a delay in providing the outcome to the applicant, and the resolution was due to expire on 30 June 2014. The CEO requested that a two week extension (from the date of the advice to the applicant) be granted to allow time for the applicant to consider the advice. That Council grant a further two (2) week extension (from the date that the advice is provided to the applicant) for the payment of the outstanding MPHS levy. A new Deed of Variation has been submitted by Department of Social Services – Emergency Relief funding. The Officer requested Council approval for the funding. That Council delegate authority to the Chief Executive Officer to sign the new Deed of Variation, securing funding until 31 December 2014. The Mayor invited the Honourable Jeffrey Seeney MP, Deputy Premier and Minister for State Development, Infrastructure and Planning, to provide Council with an update on current matters of mutual interest, in particular discussion focused around future funding of infrastructure projects in regional Queensland. Council sought advice from Minister Seeney in seeking funds to commission a feasibility study into the construction of a multi-purpose meat processing facility (goat, cattle and sheep) in Roma. Minister Seeney recommended Council make a formal request to the appropriate Minister, and local State Member for Warrego, Howard Hobbs MP, to further progress this request. Cr Wason left the Chambers at 2.50pm and did not return. Cr Denton left the Chamber at 3.45pm. Cr Denton entered the Chamber at 3.49pm. Cr Newman left the Chamber at 3.52pm. The Mayor invited John Cotter, Chairman of the Queensland GasFields Commission, to provide Council with a progress update on the resource sector from the Commission’s perspective. A number of questions were asked by Councillors concerning information sharing and verification with the industry. John Cotter in turn responded to the matters raised. There being no further business the Mayor thanked Councillors for their attendance, and closed the meeting at 3.46pm. These Minutes are to be confirmed at the next General Meeting of Council to be held on 9 July 2014, at Roma Administration Centre. Motion was lost 28 May to approve the new Supported Accommodation Assistance Program (SAAP) service agreement. 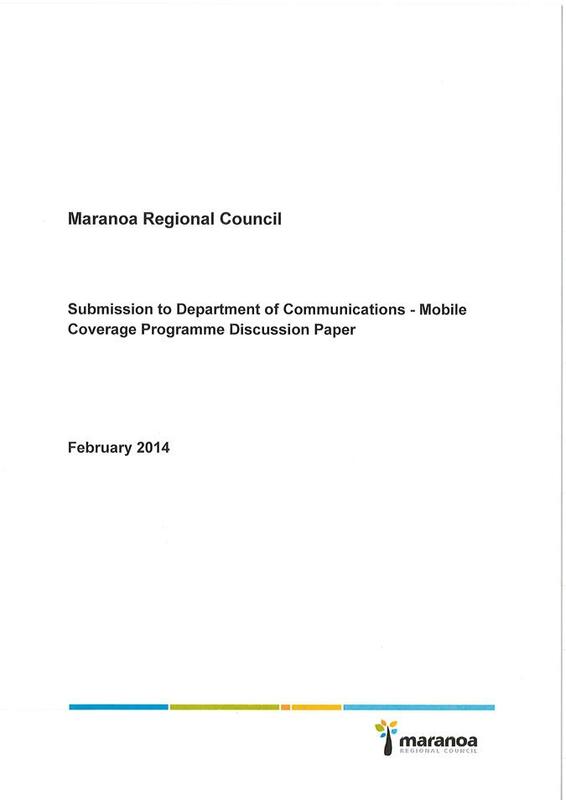 Another revised service agreement has been drafted for Maranoa Regional Council and proposed. The content within the original agreement remain, with a change only to the reporting requirements, which can be achieved. It is requested that Council decide whether to approve the new agreement for this program. That Council approve the new service agreement for the Supported Accommodation Assistance Program, due to cease 31 March 2014. That Council approves a submission to renew Council’s Supported Accommodation Assistance Program Service Agreement till 30 September 2015. Mark McConnell (Area Manager - Department of Housing and Public Works) was formally notified; requesting that the current agreement remain active and see out its scheduled expiry date 31 march 2015. 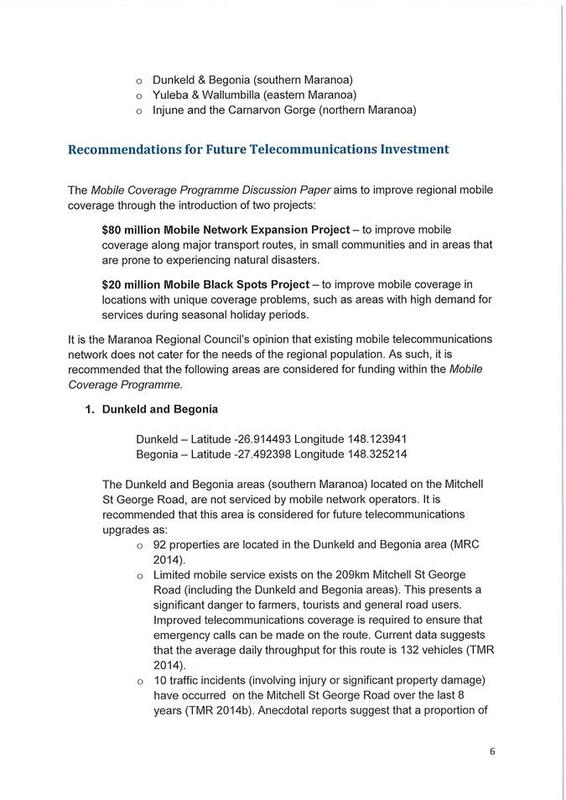 This was agreed however; to remain in alignment with the rest of the states SAAP programs under the new arrangements; a new service agreement has been drafted for Maranoa Regional Council and proposed. The only changes from the original agreement are with regards to the reporting requirements. That being; increased outputs, outcomes and targets which can be achieved by Council’s Tenancy and Property Officer managing this accommodation. Corporate Plan 2009-2013 — 8.4.8(b) To provide or assist with the attainment of crisis housing for residents who are experiencing difficulties securing appropriate accommodation. Council has received a request for footpaths be constructed on Injune streets. Council has received a request from Greg Denton to have footpaths constructed on Injune streets. Mr Denton advises that he uses a gopher to get around town and they require paved surfaces. Council Policy: Road Network Design Standards outlines the design levels for footpaths. The roads, on route from Mr Denton’s house to Hutton Street, are of a lower classification than those that require footpaths. Thus constructing a footpath would improve these roads beyond current adopted standards. The distance from Mr Denton’s residence to the existing footpath on Hutton Street is approximately 500 metres. A cost estimate has been provided for both concrete and asphalt footpaths. A third option, widening existing seal to kerb, has been included. This may provide an alternative to a footpath whilst allowing sufficient separation from passing traffic. Sealing of this area is also in line with Council’s design standards. Capital Cost of $225,000.00 and an increase of $7,500.00 per annum in maintenance and renewal costs. Thank you for your visit to Council’s Customer Service Centre on 29 May 2014 following your initial discussion with Councillor Joy Denton, outlining your request for footpaths in the township of Injune. I have undertaken an initial review of your request and have allocated this matter to Kylie Fleischfresser – Specialist Infrastructure Planning for further investigation. Following this investigation, your request, accompanied by an Officer’s Report may be formally presented to Councillors at an upcoming General Meeting. My office will be in contact again to provide you a further update on the timing of the report if required and the outcome of those deliberations. Again, thank you for bringing this matter to the attention of Councillor Denton, I will continue to keep Councillor Denton informed as the matter progresses. Please do not hesitate to contact Clara Aitken – Support Officer, of my office directly on 4624 0712, or by e-mail – clara.aitken@maranoa.qld.gov.au if you have any further questions or concerns in the interim. I refer to Council’s previous correspondence dated 6 June 2014, acknowledging receipt of your request for footpaths in the township of Injune and investigation into the matter by Council’s representative, Kylie Fleischfresser – Specialist Infrastructure Planning. By way of further update, a report will now be formally tabled at the Council meeting of 9 July 2014 for resolution. Please do not hesitate to contact Kylie Fleischfresser of my office directly on 4624 0762, or by e-mail – kylie.fleischfresser@maranoa.qld.gov.au if you have any further questions or concerns in the interim. Council has received a request for a drainage upgrade on Mountain View Road, Euthulla. Council has received a request, from Catherine and Jarrod Vaughan, for a drainage upgrade on Mountainview Road, Euthulla. Ms Vaughan states that the road is in poor condition due to heavy rain washing the road away and that the crossing prior to their property is almost impassable. Ms Vaughan requests that drainage such as culverts be installed to divert the water from the road. 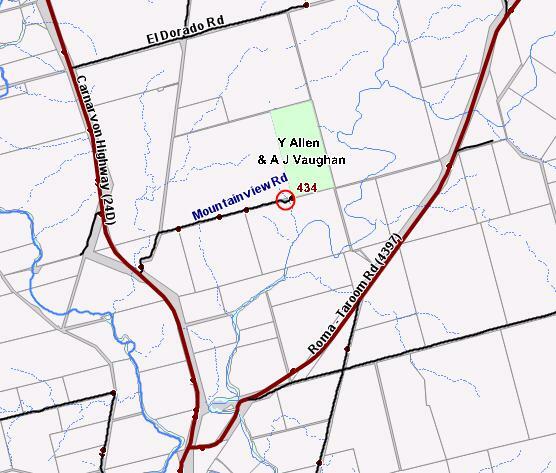 Mountainview Road is classified as Rural Access – Secondary. This road complies with the required flood immunity level of ARI of 1 for its classification. This site was inspected 23 June 2014. Formation width is generally 6 metres and pavement width varies between 3.5 – 5 metres. The crossing however, due to its vertical and horizontal alignment has 10 metre formation and 9.6 metre pavement. It was observed that the carriageway itself was in average condition with some corrugation and washed out areas. The edges of the road and table drains were deeply scoured in some parts. There is active gully erosion in some diversion drains with the gully head cutting into the road edges. Where diversion drains exist on one side of the road there are some without inverts to channel the water across the road, hence water on the other side of the road channels down the table drain and scours it out. Some diversion blocks (whoa-boys) across the road have been graded away at the sides and water bypasses the diversion, scouring the table drains. The road, for most part, is below the surrounding ground level and forms a channel for water flow. The crossing mentioned by Ms Vaughan is in poor condition with the downstream end deeply scoured out. Alluvial soil has built up on the creek bed indicating that silting is an issue. However, the road at this point is still passable. This area is particularly hilly with long steep slopes. The soil is soft loamy sand which is susceptible to erosion. In addition some neighbouring properties have cleared almost all vegetation, which would significantly increase the amount of runoff entering the road reserve and its velocity during a rain event. The waterway at this location is identified through the State Assessment and Referral Agency mapping as being Qld waterways for waterway barrier works Class 1 (Low) and Category B on the regulated vegetation management map. Waterway barrier works on class 1 waterways which are above creek bed level (including culverts) are self assessable. The Category B regulated vegetation criteria indicates remnant vegetation which would need to be considered in the unlikely event that vegetation clearing was required. The Coordinator Roads and Drainage (Roma, Injune, Rural) advises that the first kilometre of Mountainview Road received a heavy maintenance grade in February and the whole road received a heavy maintenance grade in April. He advises that he inspected this road on 30 June 2014 and that maintenance including drainage reshaping will be scheduled in the maintenance work programme for the second quarter of this 2014/15 financial year but may happen earlier if resources permit. It should be noted that the observation of active gully erosion, both in the road reserve and in neighboring properties, suggest the subsoil is vulnerable and prone to erosion. This, in addition to other factors such as rainfall, vegetation loss and the land topography, means it is likely that this road will always experience drainage and maintenance challenges. The waterway crossings could be improved through (a) construction of concrete floodways, (b) cement stabilization of pavement or (c) installation of culverts. Any upgrade works could be staged. A concrete floodway with batter protection may provide a robust crossing capable of withstanding flows. Stabilising the pavement and installing batter protection may hold the road material and help mitigate the risk of wash outs during a rain event. However the water velocity at this location may be too great for this type of treatment. There are several smaller channels additional to the main. Collecting all these smaller channels may not be achievable, however in order to collect the most amount of channels the headwall would need to be approximately 12 metres long in total. A 450 millimetre concrete reinforced pipe of approximately 9.6 metres in length should provide sufficient drainage. If laid at bed level (any lower would silt up in a single event) sub-base material would need to be brought in to build up the road. It is possible that this material could get washed away. Capital Cost of $66,840.00 and an increase of $1,898.00 per annum in maintenance and renewal costs for the requested culverts. Thank you for your letter that was received by my office on 17 June 2014. I note that you were in contact with Council’s Manager – Roads and Drainage (North East Central), Julian McEwan, in early April, and initial inspections of the road were undertaken at this time. I have escalated your request to Council’s Manager – Infrastructure Planning and Design, Kym Downey, who will investigate the matter further and coordinate a reply for you. Please note that a report may be required to go to Council for budget consideration. If for any reason you have not received an update by 8 July 2014, please contact Sheree Hurle in the Office of the Director of Infrastructure Services on 07 4624 0748 and she will investigate the reasons for the delay on your behalf. Please be assured that our officers aim for a quicker response if at all possible. Thank you for your letter addressed to Council’s Chief Executive Officer, Ms Julie Reitano, dated 13 June 2014, outlining your request for culverts at the crossing on Mountain View Road. 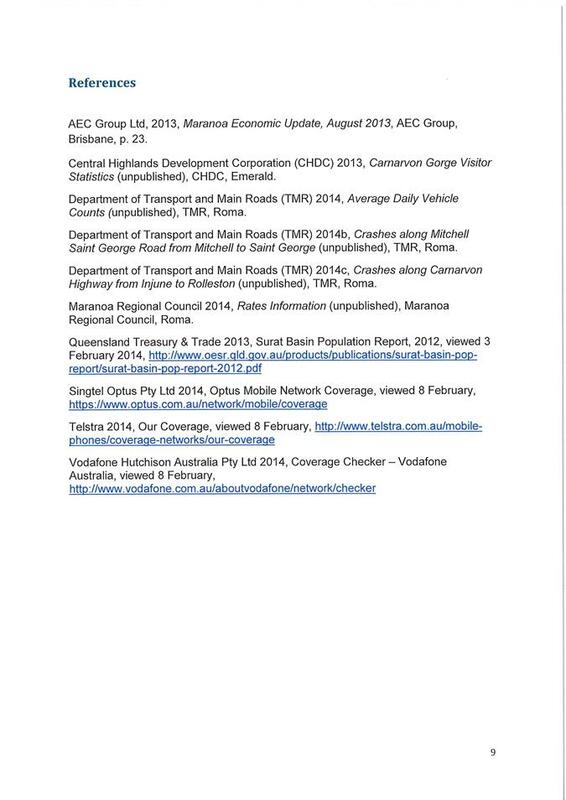 I have allocated this matter to Kylie Fleischfresser – Specialist Infrastructure Planning for further investigation. Following this investigation, a report will go to the Council meeting of 9 July 2014 for resolution. Council’s Road Register has been reviewed, and endorsement is sought for the amendments made to the register. As part of continuing improvement and updates to spatial data held on the road network, and in accordance with sections 73 and 74 of the Local Government Act, Council’s Road Register has been reviewed with several updates made. 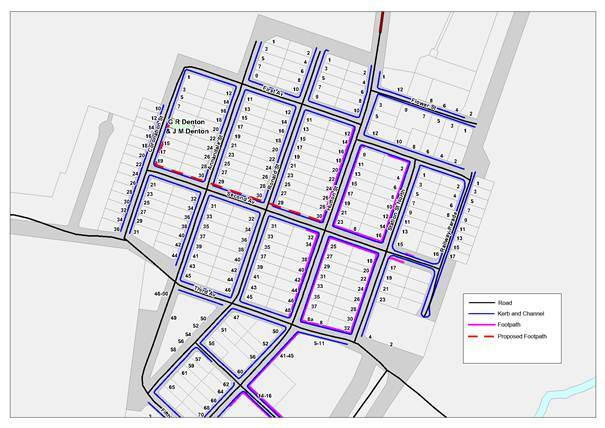 These updates comprise the inclusion of roads within new developments in Roma accepted as on maintenance since the Register was adopted by Council on 11 December 2013, and the correction of mapping alignment errors. Attached is a list of changes made to the road register. Endorsement of these changes and the adoption of the amended road register is sought from Council. The Campervan and Motorhome Club of Australia, in partnership with KEA Campers and the Queensland Department of Transport and Main Roads currently has funding available for the installation of Caravan Dump Points. The funding will cover the cost of a Gough Plastics ‘Dump Ezy’ unit, with an additional contribution of $3000.00 from DTMR. As there is currently demand for dump points to be located in Mungallala and Yuleba, an application for funding to place the units in these locations could be considered. If successful, an additional contribution of $2000.00 for each unit ($4,000.00 in total) from Council would be required to contribute to the installation of the units. 3. Consult with local communities of Yuleba and Mungallala to identify the most appropriate site, should the application be successful. 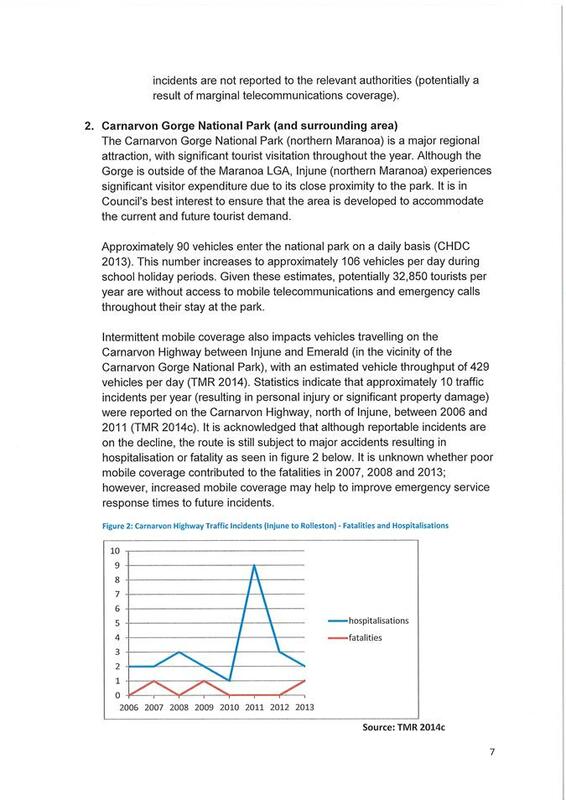 As discussed in the Councilor workshop on June 24, 2014, the Campervan & Motorhome Club of Australia (CMCA) in partnership with Kea Campers and the Queensland Department of Transport and Main Roads (DTMR) currently has funding available to support the installation by local councils of grey and black water dump points for recreational vehicle (RV) travelers. A dump point with one tap providing rinse (non-potable) water and one providing potable water, is a critical piece of infrastructure to support the self contained RV traveler market. A caravan dump point is a significant piece of infrastructure that will deliver significant economic benefit to the local government area. The CMCA and KEA Campers support the development of this infrastructure and are currently offering local government areas a Gough Plastics ‘Dump Ezy’ unit, while DTMR will provide and additional $3000.00 (excluding GST) to subsidize dump point installation. Currently, there are no Caravan dump points available to campers in Yuleba or Mungallala. Rather, additional demand is being placed on public toilet facilities in the towns, where visitors have been emptying their Caravan septic units directly into toilets. An additional financial burden is therefore placed on Council as blockages must be fixed and septic systems pumped more frequently. Installation of dump point units, including connection to a nearby sewer or septic tank is estimated to cost $5000. Should Council elect to apply for the subsidy, an additional $2000 (approximately) would need to be contributed to install the units for use by recreational vehicles. Financial contribution of up to $2000 per unit approved will be required. Corporate Plan 2009-2013 — 8.4.2(b) To operate and maintain Council’s regional tourism facilities in an efficient manner and to an acceptable standard for the enjoyment of residents and visitors. The Service Level Agreement for Public Library Service Provision with the State Library of Queensland expires on the 30 June 2014. The Maranoa Regional Council has been invited to extend the Service Level Agreement until June 2017. That Council endorse the Service Level Agreement for Public Library Service Provision with the State Library of Queensland until 2017. The Maranoa Regional Council provides public library services to the regional community under the Rural Libraries Queensland scheme in conjunction with the State Library of Queensland. The Service Level Agreement with the State Library of Queensland provides for service delivery of Rural Libraries Queensland including lending, reference and information services, free reciprocal borrowing across Queensland and support for library staff to participate regularly in training opportunities provided by the State Library to develop the library’s capacity. 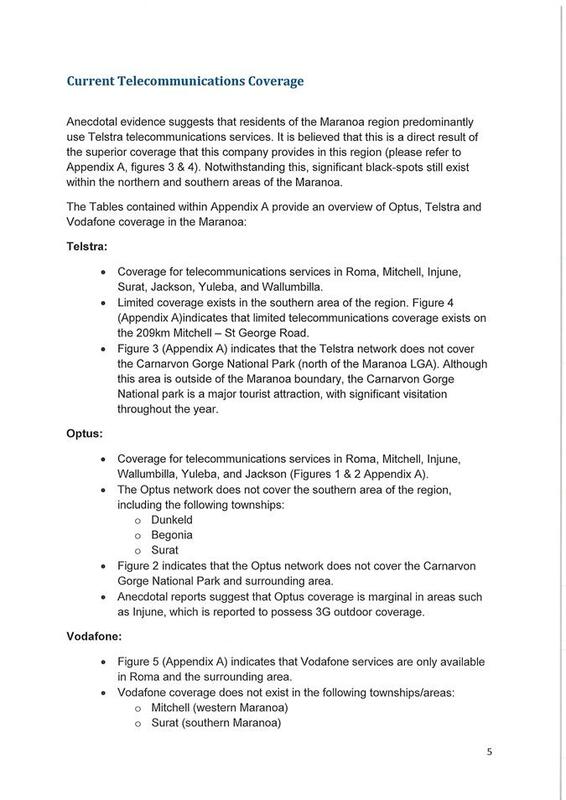 The current Service Level Agreement expires on 30 June 2014. A new Service Level Agreement for 2014-17 has been received for the continuation of service delivery for Rural Libraries Queensland from the State Library of Queensland. Rural Libraries Queensland provides access to the state wide collection via the Online Public Access Catalogue as well as additional support services, resources and best practice service delivery models. 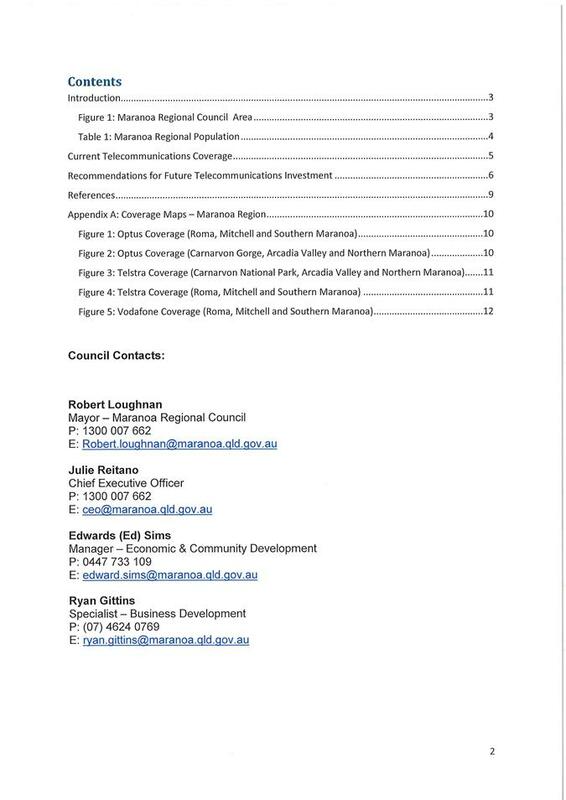 The key conditions of the agreement outlines the Maranoa Regional Council’s responsibilities and obligations as determined under Schedule B of the Service Agreement (page 6). Under the terms of the Service Level Agreement, funding is provided by the State Government of Queensland to the State Library of Queensland for the delivery of the Rural Libraries Queensland network. The funding allocated for Rural Libraries Queensland mitigates the cost to Council for library collections, staff professional development and access to electronic resources and information services. The Service Level Agreement – Schedule B also identifies the obligation for the Maranoa Regional Council to provide a free internet and Wi-Fi service to library patrons. 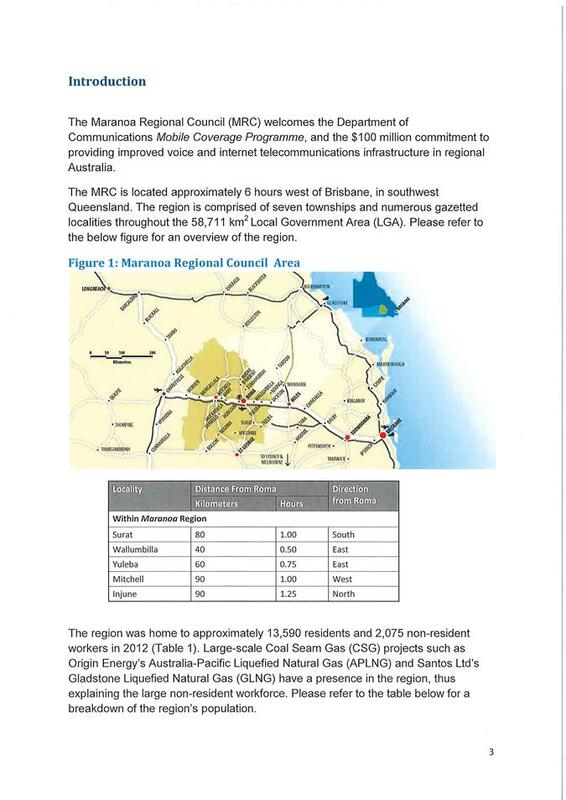 Currently, the Maranoa Regional Council provides internet access in the eight (8) libraries at a cost to users. The Maranoa Regional Council currently does not provide a free Wi-Fi access service. Council has been approached by Santos GLNG to fund a Library Information Technology Training room and information technology upgrades including free internet access for the Maranoa Regional Council’s eight (8) libraries and free Wi-Fi in the Roma, Injune and Wallumbilla libraries. If Council is agreeable to the terms of the funding agreement with Santos GLNG, the Library IT Upgrade project will offset the cost of providing free internet and Wi-Fi service to the community for three (3) years in those libraries. 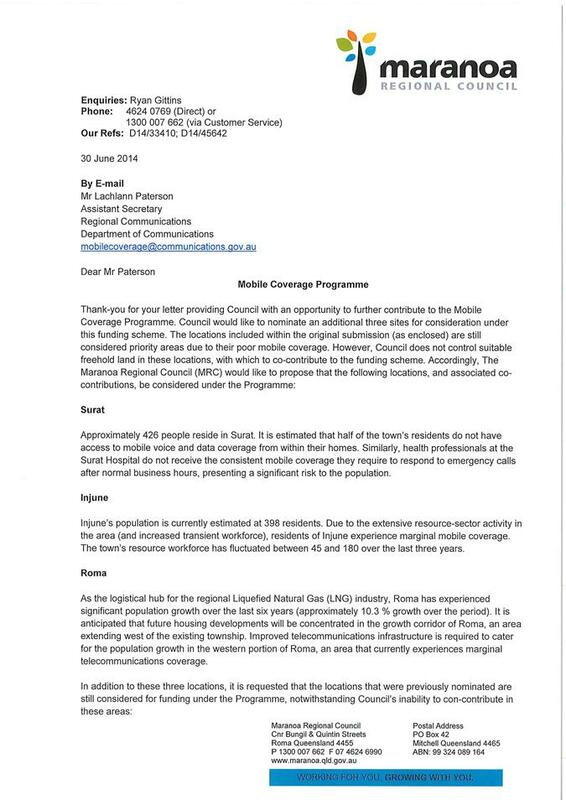 In accordance with Council’s input at the Workshops of 27 May & 24 June 2014, a response to the Federal Government’s Mobile Coverage Programme was submitted on 30 June 2014. Council’s retrospective approval of this submission is sought. Due to the tight deadlines around the timing of this response, Councillors received a draft version of the submission by e-mail and were provided the opportunity to comment before the deadline of 30 June 2014. 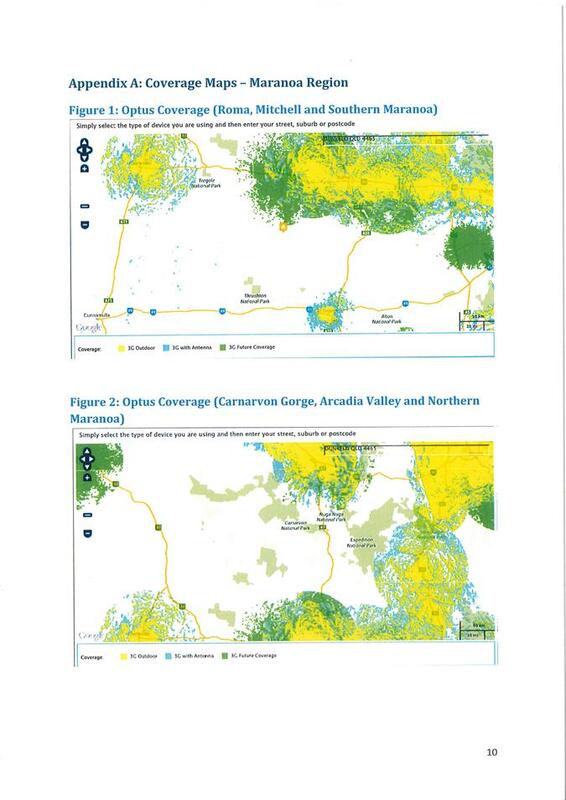 Council submitted its original response to the Mobile Coverage Programme on 28 February 2014; outlining that the areas of Begonia, Dunkeld, and Carnarvon Gorge/Arcadia Valley are priority locations for improved mobile telecommunications infrastructure. 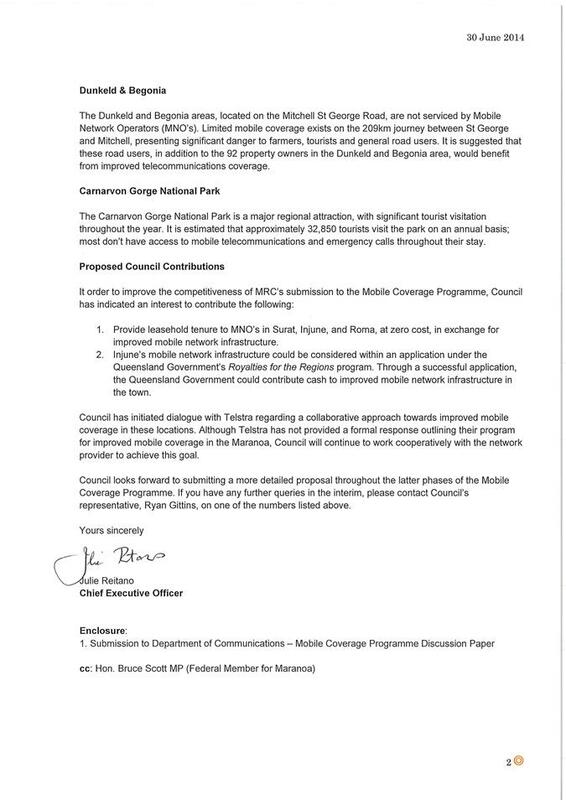 Subsequent to this, the Department of Communications has advised that over 2000 locations were put forward as having poor mobile coverage, and that Council’s (and other groups) may be required to co-contribute to improve the competitiveness of their submissions. In accordance with the outcomes of the Council workshops on 27 May & 24 June 2014, Council has advised that, in addition to the original proposal, Surat, Injune & Roma (growth corridor) should also be considered under this funding scheme. 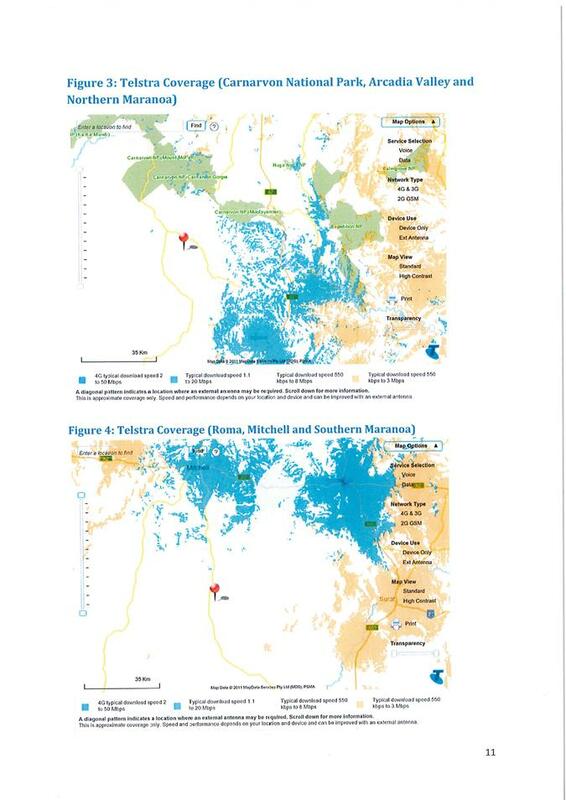 Council does own suitable freehold land in these areas, which could be provided to Mobile Network Operators (MNO’s) at zero cost. The response document raises this as a possibility; however, Council is not bound to this course of action. Confirmation of co-contributions will not be finalised until November 2014. Potential co-contribution of Council freehold land. Confirmation of this co-contribution is not required until November 2014. That Council retrospectively approve the submission to the State Government’s inquiry into the proposed Electricity Competition and Protection Legislation Amendment Bill 2014 & the National Energy Retail Law (Queensland) Bill 2014 (as attached). Due to the tight deadlines associated with this response, a draft submission was circulated to Councillors by email requesting comment by 30 June 2014. · Competition in the electricity market in South East Queensland (SEQ) through the removal of price regulation. · Consumer protection, ensuring regional consumers will continue to pay a reasonable rate for their electricity. The proposed deregulation will only impact the SEQ area, as section 90(1) of the proposed Electricity Competition and Protection Legislation Amendment Bill 2014 states that the Minister will continue to regulate the electricity price for rural and regional customers. The Energy Retail Law (Queensland) Bill aims to modify the National Energy Retail Law to ensure that regional consumers continue to access supply on a fair and reasonable basis, regardless of competitive forces (or lack thereof) and the costs associated with maintaining an expansive network in rural areas. 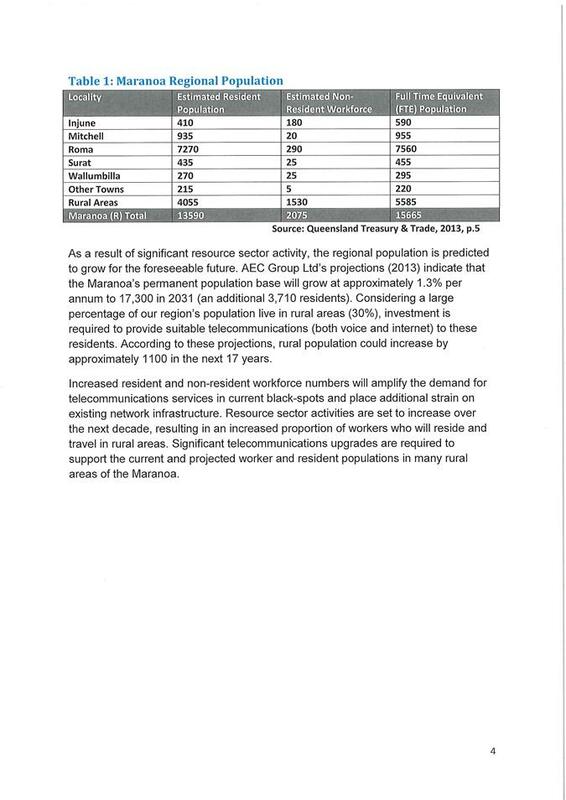 The response document reflects Council’s support of the proposed deregulation in SEQ, and suggests that electricity price regulation should continue in rural areas indefinitely.